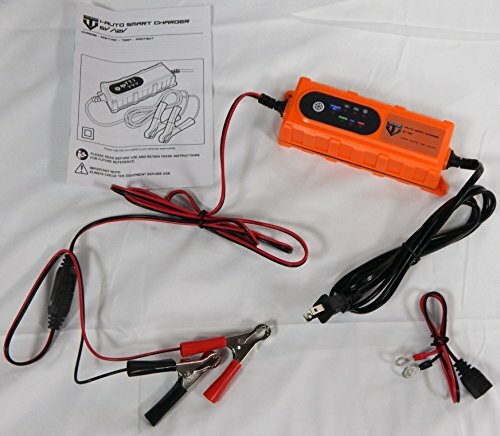 I-Auto Smart Charger 6V/12V Battery Charger / Maintainer. The I-Auto Smart Charger is an excellent all in one choice for your Battery needs Motorcycle, Car, Truck, Boat any type of 6V or 12 V Standard battery systems that use Lead Acid,Calcium , Silver, AGM or Gel Batteries 1.2-120Ah. This extremely versatile charger packs a big punch for its size measuring in at only 1-3/4" x 2-1/4" x 6.5" the charger can put out up to 4.0 Amps Which is far more than most competitors Chargers meaning you get a quicker charger then many Battery Tender, Die Hard and Noco Genius Battery Charger models. Charging Current (6V dc 0.8A +/- 5% 12V dc 4.0A +/- 5%) Max Power of 60W and features IP65 protection. The I-Auto Smart Charger comes with a pair of alligator clips for quick connect charging / maintaining / testing and a ring terminal permanent mount. The permanent mount is an excellent choice for vehicles not driven to often keep the vehicle plugged in and simply unplug the chargers plug leaving the ring terminals attached to the vehicle when you need to use the vehicle. The I-Auto Charger will keep the battery refreshed so the battery will be in peak performance when needed. The I-Auto Smart Charger can charge up to 4x faster than competitors charger units. Keep in mind a large cell battery that is completely dead may take days. While slightly low batteries will be ready much quicker. The Smart Charger is safe to leave connected 24/7 and the unit is IP65 water resistant all though is is recommended to keep the charger protected from the elements to maintain peak performance and ensure longer life of your charger. If you have any questions about this product by Trucknvans, contact us by completing and submitting the form below. If you are looking for a specif part number, please include it with your message.